One of the most talked-about rappers of the year, and a member of hip hop mag XXL's Class of 2009, swaggers into Notting Hill's Tabernacle this week. Asher Roth's appearance in the year of Eminem's return may be a coincidence, but the reemergence of the first talented white rapper to really hit the mainstream (sorry, Vanilla) offers the younger artist an obvious foil. Roth doesn't disappoint: on "As I Em", off debut album Asleep In The Bread Aisle the Pennsylvania native tweaks his already-similar flow into a carbon copy of Marshall Mathers', paying tribute to Eminem's trailblazing success but then pleading with fans to judge him on his own merits. The comparison's a little asinine as lyrically and sonically the two rappers are worlds apart. A self-proclaimed middle-class suburbanite who says his first great musical love was Dave Matthews and who glories in his lack of an impoverished, criminal past, Roth revels in banalities. "I Love College" his slacker anthem about a keg party, is the quintessential track: with tales of late-night partying and an oddly celebrated line about scoring "pizza for a dollar a slice" it seems like the product of a focus-group seminar designed to hook the campus crowd. Dropping his album on the 20th April (ie, 4/20 in US date order) certainly locked in the stoner dropout niche: for building a fanbase, Roth did his homework. 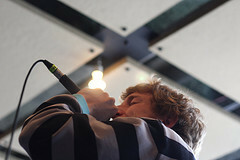 Yet despite the generally disappointing album (Pitchfork were particularly unstinting in their criticism) and the occasional whiff of too-canny-by-half marketing, Roth's a genuine talent on the mic, with freestyle lyrical skills to boast of and a burgeoning reputation for rocking live shows. Expect a young, boisterous crowd at this week's London show, and expect the man on stage to give as good as he gets. Asher Roth plays the Tabernacle, Notting Hill, W11 2AY (map) on Thursday May 7th. Tickets from £15 (not including booking fee, transaction fee, etc. ).